Alt Text: "We'll pay you $1.47 to post on social media about our products, $2.05 to mention it in any group chats you're in, and 11 cents per passenger each time you drive your office carpool past one of our billboards." The now nameless OP who typed the wrong comic name and forgot the link wrote: This explains the spread-spectrum microwave emissions from my xkcd t-shirts. Oh our sales taxes are layered monstrosities, with wild differentials of applicability and rate. Except where exempt. Generally there's a state rate, onto which is added a municipal rate, and these vary widely. Worse, some states don't tax certain goods, and some municipalities don't tax others, unless you're in a tribal-owned store, in which case the sets are shifted kinda arbitrarily, and the rate's probably higher. Where I am, the initial pre-tax value would've been $21.18, but in other places, like parts of Texas, food staples aren't taxed, reducing the effective rate depending on what the groceries comprise. Archgeek wrote: Where I am, the initial pre-tax value would've been $21.18, but in other places, like parts of Texas, food staples aren't taxed, reducing the effective rate depending on what the groceries comprise. California as well, however it's more complicated than that* with arcane rules and structures. article wrote: California's government has spent vast amounts of time and effort determining that sales tax is due on a sandwich a convenience store clerk warms in a microwave for a customer, but not on a sandwich a customer warms in the store's microwave — a price difference of 8.5 percent in San Francisco and up to 9.75 percent in other California counties. If you have 1000 or more loyalty points, we won't tell anyone about those pictures of leather-corseted grandmothers on your phone. qvxb wrote: If you have 1000 or more loyalty points, we won't tell anyone about those pictures of leather-corseted grandmothers on your phone. Ah. Now, you see I'd always assumed that it was my loyalty they were touting. Now I understand. And I'll have to tell my grandmothers to wear something different (or at least more!) on their next Whatsapp updates to me. I refer the honourable gentleman* to the statement I made earlier. Is there a reason this thread title is incorrect? Title from the last comic bleeding into this one, or something? Now where are my rewards?? Ah, I hadn't checked, and assumed it was Randall being enigmatically thematic, or something. Buy a chunk of meat to make a sandwich? Not taxable. Pay the deli guy to slice it for you? Still not taxable. Pay somebody to put the sliced meat on the bread for you? Now it's taxable. Buy pizza ingredients? Not taxable. Pay someone to assemble them into a pizza for you? Still not taxable, even though sandwich assembly makes sandwiches taxable. Further pay them to cook it for you? Now it's taxable. Get a massage? Taxable. Did your doctor tell you to? Then it's not. Here's the general rules for taxable services here in Minnesota, since "selling" something doesn't mean selling some "thing". Which links you to a page with 86 separate "fact sheets" about specific businesses, and what services and products they may sell that are taxable. And what things fall into what category*. At least there's a "subscribe" link, so the State updates you whenever it updates these hundreds of pages of sales-tax rules. Hopefully. In the U.K.? I figured y'all would give your scandals a more ornate-sounding suffix than -gate. * e.g. The "candy" document tells you "cotton candy" is not candy. (It does not tell you what it is, just that it's not candy.) My tax dollars paid someone to come up with this. Hopefully that guy is entirely paid with sales tax collected on cotton candy, so I can claim it's not my fault. ** Well, 50+***, since I'm sure D.C. and Puerto Rico and other non-State parts of the USA have sales taxes too. *** Did I say 50+? Never mind, there are county and city sales taxes, too. Iowa has 99 counties, and 93 collect their own sales tax, on top of the Iowa state rate. Those price rates are actually pretty tempting. If a company actually offered that, I think I'd take them up on that offer. $500 a day to post on social media and forums and such? Yes please. orion205 wrote: Is there a reason this thread title is incorrect? Title from the last comic bleeding into this one, or something? Second time I've miscopied the title. Is there an easier way to do this right than opening four windows, (page, page source, example template, post reply window), cut and paste text, or write it all down first ... or remember, which is becoming a problem? Perhaps those desiccant packs don't actually help preserve memories ... if orion205 also wants to try some, that is today's reward. keithl wrote: Second time I've miscopied the title. Is there an easier way to do this right than opening four windows, (page, page source, example template, post reply window), cut and paste text, or write it all down first ... or remember, which is becoming a problem? You can edit the 1st post and change the title yourself, and it might change the title for the index page (though not on everyone else's replies). 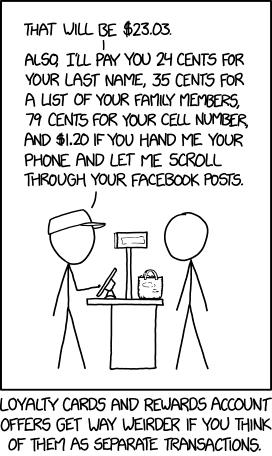 that would add the link back to the comic page, which your post is missing, too! keithl wrote: Is there an easier way to do this right than opening four windows, (page, page source, example template, post reply window), cut and paste text, or write it all down first ... or remember, which is becoming a problem? I use two tabs. Upon discovering the opportunity to fill the gap of a new comic I usually have done this by the tab next to the forums tab on the comic page. The time spent doing this works well to stop me being over-eager to "First Post!! !111oneoneone" a thread (IME), and lets me consider my personal postfix more carefully than if I raced to use (say) that web-page someone designed to autoformat everything. Ninjaed, especially by the link to chridd's page that I had meant to look up and insert myself. But I've typed it and think it works for me, so there you are so you can laugh at it. Soupspoon wrote: post it into the true thread. Someday I may catch up with the true thread. I lost track after the end of Time. It gets worse when you are just visiting. Legislators realized that voters are unlikely to need [local] hotel and rental car services, so they heap plenty of local taxes on them. These are so often tacked on to such things that you don't notice things like "cleaning fee" tacked on to your hotel bill. While you shouldn't expect the cash register to ring up exactly what it on the price tag, don't even think that a hotel bill will be nearly as close when they ring it up. The funny thing is that this is better than the "fashion" community where you're expected to give them free advertising for nothing. Every time I'm at the beach and I see someone with a Nike "swoosh" on their swim trunks, I think "how would you react if I asked you to pay me for clothes with my name painted on your behind? And pay more than you would for un-printed clothing." I suspect most normal people would respond negatively, some violently so. But these same people voluntarily do just that all the time when the name is a designer logo. And they get indignant when you point this out to them. It's actually wine, with the alcohol cooked off (or though some other means) which is then carbonated. It's not sweet like juice, but dry like wine...just without the alcohol. It's strange stuff, and you only ever see it when you come across someone who's a teetotaler, but was once a wine drinker. Shamino wrote: The funny thing is that this is better than the "fashion" community where you're expected to give them free advertising for nothing. No idea how long this has been going on, but during the recent NBA playoffs I noticed that every team had a Nike swoosh on the right side of their jerseys, and some other corporate logo on the right side (Coca Cola, United Airlines, IBM, etc.). But not all. Houston only had the right side Nike and nothing on the left (shoulda' used a "Your logo here" patch). Wondering how Nike got the ubiquitous spot, and what it costs to get the left side? Apparently the Rockets have set their price too high. Leela: "Didn't you have ads in the 21st century?" Fry: "Well sure, but not in our dreams. Only on TV and radio, and in magazines, and movies, and at ball games... and on buses and milk cartons and t-shirts, and bananas and written on the sky. But not in dreams, no siree." Also, I just realized that that quote contains an error, as Fry was frozen for all but the first few seconds of the 21st century. (Or all of it plus all but the first few seconds of the last year of the 20th century, depending on when you count your millennia). Heimhenge wrote: No idea how long this has been going on, but during the recent NBA playoffs I noticed that every team had a Nike swoosh on the right side of their jerseys, and some other corporate logo on the right side (Coca Cola, United Airlines, IBM, etc.). But not all. Houston only had the right side Nike and nothing on the left (shoulda' used a "Your logo here" patch). Wondering how Nike got the ubiquitous spot, and what it costs to get the left side? Apparently the Rockets have set their price too high. It's still gonna take them decades to catch up to NASCAR. Especially the hat-swapping part. It's still gonna take them decades to catch up to NASCAR. I wonder how their carbon footprints compare. I think what's weird about sales taxes in the U.S. isn't that they exist, or which levels of government levy them, or how high they are, but that stores are not required to show prices that include them on their price tags. There are circumstances (though rare (and now, even moreso)) where sales tax may be deductible from your gross income when computing your Federal Income tax liability. There are hoops to jump through and "proof" that of how much yuo paid to which entity is one of them. A receipt itemizing the amounts gives you that. A receipt can still show how much of the price is tax, though. GlassHouses wrote: I think what's weird about sales taxes in the U.S. isn't that they exist, or which levels of government levy them, or how high they are, but that stores are not required to show prices that include them on their price tags. Personally I hate that. Like an embedded culture of lies. (It costs this much... But wait! Gimme more!) Tips are a bit like that too, but at least the specifics are up to you even if the whole thing is poorly documented and inconsistent. Shopping overseas is so much nicer. Oddly enough, in some states, it's actually not legal to show sales tax as part of the price. Government decision, not a retailer decision. Obviously, retailers there have to comply, and chain retailers in both those states and others prefer to use a consistent pricing schema across the chain to avoid confusion. So as a result, it's a standard basically everywhere. In some cases the taxes are included in the price though. Gas taxes, they are. The whole thing is really a needlessly confusing mess. NASCAR actually produces much less carbon than other sports, just because they drive between events (40 cars is a lot of checked baggage fees), while other sports (NFL, NHL, MLB, World Cup soccer, Olympics) usually take jets everywhere. Also, NASCAR races are held outdoors, so there are no giant stadiums to heat or cool. Thinkprogress says a full year of NASCAR races (just the cars) produces 1800 tonnes (1.8 million kg) of CO2. I couldn't find an easy source for their between-race transport, but if it's 3 tractor-trailers per car, times 40 cars, times a generous 1000 miles between every race, times 35 races, and a loaded tractor-trailer rig gets 6 miles per gallon and produces 2.77kg of CO2 per gallon, that's about another 2000 tonnes (2 million kg) per year. For comparison, NPR reported that a single NFL Super Bowl game (excluding transport to and from the host city) would produce about 450 tonnes (500 USAan tons) of CO2, mostly from utility costs for the stadium and for local transportation (limos, buses, taxis, etc). And there are 500+ other games leading up to the Super Bowl every year. For another comparison, the 2010 World Cup, because it was held in South Africa, generated 2.8 million tonnes of CO2, with 85% of that being transport costs. That was listed as "9 times more" than the 2006 one in Germany, because of the high transport costs. That doesn't mean that the 2010 World Cup is equal to 750 years of NASCAR, or the 2006 one to 80 years of NASCAR, since I have no idea how to figure fan/media transport costs for a NASCAR race. But it gives a sense of scale. The actual carbon produced by the race cars themselves is tiny compared to the transportation costs for fans/teams/media for any sport, including racing sports themselves. Keyman wrote: There are circumstances (though rare (and now, even moreso)) where sales tax may be deductible from your gross income when computing your Federal Income tax liability. There are hoops to jump through and "proof" that of how much yuo paid to which entity is one of them. A receipt itemizing the amounts gives you that. But that could work just as well while displaying the prices with sales tax included. In Hungary bills are required to list the sales tax for every item separately, so if your purchase is eligible for a tax refund (for example because your company resells the item in some form), you ask for a bill at the counter (most places give you a small, short-lived receipt otherwise). Meanwhile everyone else can just see how much their stuff will cost instead of having to mentally add some arbitrary percentage because some people need to know the prices sans tax. Huh, so the institutions of sportsball are, as societal extravagances on massive scales, managing to do tremendous climatological damage. That's...not going to be easy to fix. I thought the jets would count heavily against NASCAR, because NASCAR's regional and the guys paid tens of millions a year (to kick an artificial pig-bladder wrapped in cow-skin around a plastic lawn) fly all over the world all the time. I didn't expect those orders of magnitude, but I thought the 107 quid/bucks/euros sports would be the messier ones. That's...not going to be easy to fix. No stadiums. No more city funds being ransacked to build them, no more giant concrete wasteland for parking, no giant building to condition the air of, no more travel as there isnt a home court advantage without a live crowd so no reason the players can't live all in the same town during the season. Sure the teams'll hate it, so it'll never happen, but it's not a hard fix otherwise, imo. Keyman wrote: There are circumstances (though rare (and now, even moreso)) where sales tax may be deductible from your gross income when computing your Federal Income tax liability. There are hoops to jump through and "proof" of how much you paid to which entity is one of them. A receipt itemizing the amounts gives you that. Here in this state, if you are buying something to resell (and in some other cases) you can obtain a "Sales Tax Exemption" certificate. You present this at time of purchase, and they don't charge you the tax in the first place. Because...refunding sales taxes??? Until I bought several spendy things on a trip to the UK in April, and they offered me a special detailed receipt, and another form, and an envelope...and directions to the places to drop it at the Edinburgh airport... I didn't know there was such a thing.